This super thin and flexible HDMI cable has been specially designed for connection to devices in confined spaces or with restricted access to the HDMI ports. The small form factor connecting housing and slimline cable construction is perfect for connecting to awkwardly placed devices in a rack or to displays mounted close to a wall. Unlike some slim HDMI cables from other suppliers this cable contains active electronics to amplify the signal (Redmere HDMI) - essential when using thinner cable to send 18Gbps HDMI over distances greater than 1m. Ultra Fast 18Gbps data rate, ready for HDMI 2.0 equipment, backward compatible with HDMI 1.4 equipment and older versions. 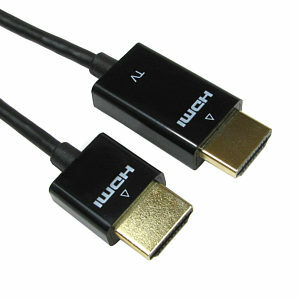 Micro HDMI to VGA Converter Cable with Audio. Ideal for connecting tablets or laptops with a micro HDMI output to a monitor or TV with a 15 pin VGA input. Easy to Use: Installs in seconds and does not need drivers. Converts Micro HDMI to VGA video with audio. 3.5mm Stereo output port. Built in Micro HDMI cable. Input Micro HDMI. Output VGA plus 3.5mm. Supplied with 3.5mm audio cable.